Safety of your information and software infrastructure are always under scrutiny. Knowing about problems should necessarily be the first and foremost step in solving them. Do make yourselves aware of potential malwares before your pc gets corrupted. Let’s look at the basic existing PC threats. Malware or malicious software includes all sorts of PC threats not limited to viruses. Any software that brings harm to PC or intends to steal your data is a malware. They need a host computer or network to function. Mode of transmission could differ with different categories of malware. Virus file typically copies itself from folder to folder, drive to drive and PC to PC. PC to PC copying happens through file transfer. 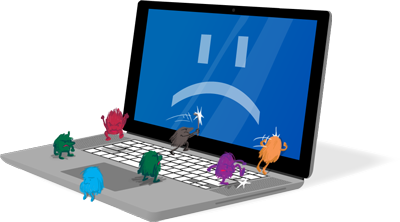 Viruses are capable of getting along with executable files and perform undesirable PC activity. This sneaky file gets your information from PC without you knowing about it. Information and identity theft are dangerous on the victim in the digital era. Since the purpose of spyware is to gather as much information as possible, it doesn’t bring harm to PC in most cases. Trojans most often than not translates to backdoor. They appear miles away from being malicious software, but perform harmful actions at the backend. In most cases, it creates a backdoor, making you to be vulnerable to attack or being controlled remotely. Worms use networks to create and send copies of them. They don’t need any action from user for their transport from PC to PC. Their juggernaut runs through the network while they infect every device in its path. This malicious ware hides itself from detection to get access to your PC without your knowledge. It provides the attacker with administrative access to victim’s PC. With automated installation being a real possibility, your PC can be under attack any day. Shareware’s only intend is to hold you hostage on grounds of false threats in order to get a ransom. To our dismay, most of them come in the form of anti-virus software and malware fighting software to deceive us.